President Maithripala Sirisena yesterday declared all areas affected by floods and landslides as High Security Zones (HSZs) and instructed officials to bring all houses affected by disaster under proper technical evaluation before resettlement of families. The Special Task Force presided over by President Sirisena also decided to ban reclamation lands in the Western Province from yesterday. The President instructed officials not to allow any unauthorised dwellings. The officials pointed out that unauthorised settlements and reclamation of lands have led to the disaster situation. President Sirisena instructed the officials to ensure maximum assistance to the people affected by floods and landslides and to continue the welfare services without considering about the financial allocations. The Task Force decided to grant a technical allowance of Rs.10,000 for a house affected by floods and landslide. The Task Force members extensively discussed as to how people can be assisted to bring their life back to normal after the water level recedes. They focused on resettlement of people affected by disaster and their health needs at this meeting. President Sirisena instructed the officials to put in place a proper mechanism to acquire lands for the resettlement of families displaced by the disaster. He said special attention should be drawn to the education of children affected by the disaster. It was mentioned at the meeting that the United Nations has agreed to provide technical assistance to clean the area affected by the disaster. Disaster Management Minister Anura Priyadarshana Yapa outlined the relief programme launched by the government. He said that five countries Japan, India, Turkey, The Maldives, Pakistan have provided assistance to the people affected by the disaster and many countries have agreed to help with the welfare of the people. 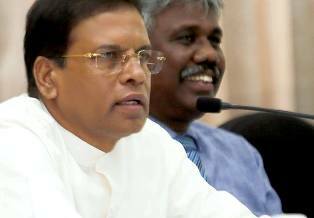 Meanwhile, Sri Lanka Land Reclaimation and Development Corporation Chairman Asela Iddawela yesterday said that President Maithripala Sirisena issued instructions to them to remove squatters and unauthorized dwellings which are blocking canals and waterways in the city. Iddawela also said that the President instructed them to find suitable lands for the relocation of these unauthorised dwellers. He said that the reclaimation of lands in the province was banned from yesterday.